Dr Robert Casteels is a renowned composer, conductor, educator, pianist, educator and researcher who believes that these roles are fundamentally interrelated in the kaleidoscope of activities that is music making. Casteels has conducted more than 50 professional orchestras in 20 countries in a repertoire of 600 works ranging from the early classics to contemporary music, from symphonic to vocal and dance repertoire. He has conducted first performances of symphonic works, ballets and operas in festivals such as: Spoleto Festival (Charleston, US/ Spoleto, Italy/ Melbourne, Australia), Ars Musica (Brussels), Brisbane Biennale (Australia), Focus (New York), Wien Modern (Vienna), Donaueschingen and Berlin Biennale (Germany). Casteels obtained his first prize in piano at the Royal Music Conservatory of Brussels. After first prizes in harmony and counterpoint, he studied composition with Fernand Quinet in Brussels and Peter Maxwell Davies in Dartington, England. He graduated from the French and Flemish Royal Conservatories in Brussels in piano and orchestral conducting, as well as from the Eötvös Institute in Hungary, the Guildhall School of Music in London and the Juilliard School in New York. His conducting mentors included Leonard Bernstein, Pierre Boulez, John Carewe, Peter Eötvös, Sixten Ehrling, Pierre Fournet, Zubin Mehta, Jorge Mester, Michel Tabachnik, Vilem Tausky and Ronald Zollman. 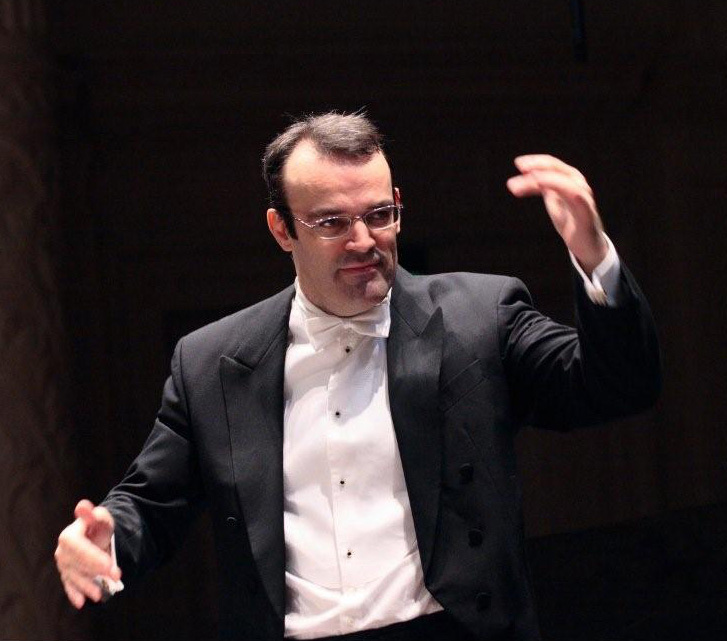 Following his graduation from Juilliard, he was appointed staff conductor at the Brussels Royal Opera House and Head of Conducting Studies at the Brussels (Flemish) Royal Music Conservatory. At the Conservatory he also set up an opera studio that was a great success at helping young singers bridge the gap between tertiary-level training and professional life. Casteels is the recipient of several awards, including the Bruno Walter Scholarship for Orchestral Conducting awarded by the Juilliard School for two consecutive years, as well as the First Prize for contemporary music at the International Conducting Competition of the Hungarian Radio and Television. In 2001, Casteels became the youngest recipient and the second musician ever to receive the prestigious Christoffel Plantin Prize, the Flemish Government’s highest award for cultural achievements, in recognition of his contribution to cross-cultural research. As a much sought after chamber music pianist and vocal accompanist, Casteels has performed with many instrumentalists, singers and co-pianist Shane Thio. Such productions as pianist/musical director include: An Evening of Love Songs, the musical Oliver Twist, pOpera part for Flip Side in conjunction with the Singapore Arts Festival 2009, La Belle Epoque, an evening of European operettas and art songs at the turn of the 20th century, Another Murder on the Orient Express, Not Quite the Moulin Rouge…, An Evening at the Opera, George and the Music Box and The Scent of Josephine Baker. Whilst continuing his conducting engagements on the international stage, Casteels shifted the focus of his activities from Europe to Australasia, choosing Singapore as his home base in 1995, and taking up permanent residency in 1996. Since then, he has contributed tirelessly to Singapore’s music scene – Casteels has served as Dean of the Faculty of Performing Arts at the LASALLE-SIA College of the Arts (LASALLE), as a member of various competition jury panels and government-appointed arts and education committees, as Music Director of the Singapore National Youth Orchestra (SNYO), as Founding Artistic Director & Resident Conductor of the Philharmonic Winds, as Music Director & Conductor of the National University of Singapore (NUS) Choir, NUS Wind Symphony and the NUS Guitar Ensemble (GENUS), as guest conductor of the Yong Siew Toh Conservatory of Music Chamber Singers and New Music Ensemble. Casteels’ achievements include producing SNYO’s first cd recordings of professional quality as well as conducting SNYO’s debut at the Esplanade Concert Hall, producing GENUS's first cd recording. He has premiered iconic masterpieces in Singapore, such as works by Boulez, Ligeti, Takemitsu, Stockhausen and Varèse. He champions the works of his fellow Singaporean composers by organizing and conducting successful concerts entirely devoted to emerging Singaporean composers and by regularly including Singaporean works in concerts of standard repertoire. His newest project entitled ‘Pictures at an SG Exhibition’ pairs ten young Singaporean composers with ten iconic paintings exhibited at the National Gallery. He has collaborated with more than 50 Singaporean visual and performing artists, and was co-founder of the LASALLE Gamelan Ensemble, which has performed in New Zealand, Australia and Indonesia. In 2005, he led the Philharmonic Winds to win the Gold with Distinction Award at the World Music Contest of Kerkrade (The Netherlands) with the highest mark ever scored by a Singaporean group. In 2007, Casteels became a proud Singaporean citizen, focusing his activities on composing and teaching. Casteels is one of those composers whose music makes an immediate impact on the audience. The idea of following tradition, rules and stylistic imperatives is completely foreign to a body of music which really mixes it up. His growing corpus of more than 120 musical works cross cultures, genres and disciplines: 1 opera, 3 masses, 5 works for carillon, 5 symphonies, 6 choral works, 6 concertos, 10 works akin to symphonic poems, 10 art songs, 13 instrumental solo pieces, 14 gamelan pieces, 18 ensemble pieces and 19 chamber music works. His compositions range from miniature to large-scale works in the European tradition, as well as multidisciplinary works which combine European, Chinese and Indian instruments, as well as the gamelan, together with computer-generated sound and images. His compositional trademark is the organic combination of European and non-European instruments. Nine audio and two video compact disks entirely devoted to Casteels’ works have been published thus far. Asian music is one of Casteels’ great passions and sources of inspiration. In 2004, the University of Melbourne awarded Casteels a Doctorate for his thesis on gamelan and contemporary music. As Artistic Director of the Asia-Europe Foundation’s (ASEF) 1st music camp I’mPulse held in the Philippines in 2005, he conceived and executed an initiative which brought together young graduates from the universities and conservatories of 35 ASEF countries to perform and record each others’ works. In 2008, Casteels conducted ASEAN Serenade, an evening of music, song, dance and poetry from each ASEAN country in homage to National Cultural Medallion winner, Mr Alex Abisheganaden. In 2009, 2010 and 2012, Casteels released four CDs and a dvd entitled ‘Resonances of Asia’, bringing the listener on an aural journey through China, India, Japan, Java, Korea, Philippines, Mongolia, Myanmar, Thailand and Vietnam. Chronologically, the compositional output of Robert Casteels can be divided into three periods: 14 opus numbers, mostly atonal, composed in his country of birth Belgium from 1981 to 1988, followed by a gap of seven years of compositional silence, then -coinciding with his arrival in South-east Asia- a second period from 1995 to 1999 with 19 opus numbers focused on spectral music and gamelan, followed by a silent year in 2000, and since 2001 a third period of 87 compositions, mostly modal or poly-modal. His compositions have been premiered or performed in Australia, Belgium, China, England, Indonesia, Japan, Korea, Malaysia, New Zealand, the Netherlands, the Philippines, Singapore and Vietnam. In Singapore, Robert has been commissioned by private patrons and institutions such as: the Alliance Française de Singapour in 2005 and 2009, the Arenbergkoor-Leuven in 2017, the ArtScience Museum at MBS in 2015, the Asian Civilisation Museum in 2003, Banque Crédit Industriel et Commercial in 2009, the Chamber Players in 2010, the City Garden Fund in 2003 and 2009, the Composers Society (Singapore) in 2017, the Contemporary Asian Arts Centre in 2002, the 7th I light Singapore Festival – bicentennial edition in 2019, the Institute of Policy Studies, LASALLE-SIA College of the Arts and the Ministry of Education in 2004, the National Gallery of Singapore in 2018, the National Museum of Singapore in 2011, the National University of Singapore in 2002, 2005, 2006 , 2009 and 2014, the Old Parliament Arts House in 2007, the Philharmonic Winds in 2010 and 2015, the Singapore Arts Festival in 1999 and 2006, the Singapore Symphony Orchestra in 2019, the Singapore Wind Symphony in 1996, the Singapore Youth Choir Ensemble Singers in 2015, Tedd Joselson in 2017 and the World Association for Symphonic Bands and Ensembles (WASBE) in 2002. Great care is taken into the publishing of his compositions. Covers of the scores have been created by or are based on works by Anamics (designer), Arena Natacha (painter), Blanchard Jean-Pierre (painter), Bouton Cyril (drawer), Chan Choon How (designer), Cheong Soo Pieng (Painter), Chua Remus (astro-photographer), De weerdt Romy (designer), Foubert Chris (designer), Geukens Hilde (drawer), Giouw Jolie (designer), Leung Neol Yick Chuen (designer), Mintio (photographer), Miyamoto Nalu (katana artist), Oosterlynck Baudouin (photographer), Saeko Kitai (photographer), Sangreo, Franco Coralde (designer), Seah Huan Yuh (designer), Sharm A.H. (designer), Supari Sutari (illustrator), Tan Katryna (drawer), Thierie Sven (designer), Thomas Andrew (photographer), Verschueren Bob (installation artist), Von Gonzales Dunhill (designer), Wauters Dirk (painter), Wong Sher Maine (photographer), Woo Ian (painter), Yang Joshua (painter) and Ye Shufang (painter). In 2004, Casteels was appointed the 1st Associate-in-Residence (Special Music Projects) by the NUS Centre for the Arts. He initiated, raised funds and executed a series of special projects that combined music and other disciplines in a meaningful collaboration between international and Singaporean artists: ‘the Magic of Music in Movies’ in 2004, ‘Music and Architecture’ in 2006, ‘Food, Plants and Music’ in the Arts House at the Old Parliament and Petronas Galeri in Kuala Lumpur in 2007, 'Music and Birds' in 2009 in collaboration with the Singapore Botanic Gardens’ 150th Anniversary celebrations, in 2011 in collaboration with Yong Siew Toh Conservatory of Music and in 2015 in collaboration with SG50, 'Music and Finance' in 2011, 'Music and Astronomy' as well as 'Music and Medicine' in 2012. ‘Floating Lighthouse’ with light designer Ryf Zaini and visual artist Milenko Prvački in 2019. 'Hearing Images&Seeing Sound' is a 2016 transdisciplinary project conceived by Robert Casteels and funded by the Creation Grant of the National Arts Council. This research project brought together visual artists Milenko Prvački and Joshua Yang, videographer Hilmi Johanna, electro-acoustician and e-luthier Dirk Johan Stromberg, composer and conductor Robert Casteels as well as singers Evelyn Ang, Angela Cortez, Melissa Estrella, Daniel Ho, Jeremy Koh, David Ng, Leslie Tay and Felicia Teo. The research culminated into a performance evening that took place on 14-12-2016 in the Dhoby Ghaut Visual Arts Centre followed by an eponymous exhibition. A 77-page catalogue published was in March 2017. A continuation and expansion of this transdisciplinary project will take place in April 2019 under the title ‘time:crystals’ with the creation of ‘Nine Dragons’ with videographer Cécile Chagnaud. The year of 2013 was dominated by the premiere of his first opera 'De Kaartridder', commissioned by the city of Landen in Belgium to celebrate the 800th anniversary of its founding. The main theme of 'De Kaartridder' (meaning the Knight with the cards) is gambling. The protagonist is a 120-strong chorus. In 2013 Casteels composed for the first time for carillon, an ubiquitous instrument that is part-and-parcel of the sonic landscape of every city of Flanders. Five works for carillon were premiered in Leuven and Tienen, his city of birth. The year of 2014 marked his debut in Japan where he conducted 'Semisopochnoi' concerto for electric guitar, 'Cityscape' for guitar orchestra and electro-acoustic sounds, as well as the premiere of his symphonic poem 'Kaze Ni Noru' by the Tokyo Philharmonic Orchestra under his direction, as part of the 32nd Asian Composers League Festival & Conference. His ritual music entitled ‘Sälapa’ on Pala’wan poetry was selected by the 33rd Asian Composers League Festival & Conference in the Philippines to close its final concert. Casteels conducted the premiere of 'Cu Rua' for dan bau and orchestra for the opening concert of the 34rd Asian Composers League Festival & Conference in Hanoi, Vietnam. The year of 2015 witnesses the premiere of fourteen new compositions for organ, piano and two pianos, orchestra and ensemble. Flautist Roberto Álvarez and harpist Katryna Tan performed 'Nachtlied' by Casteels during their 2015 Australian concert tour. The Philharmonic Winds created 'Hanging Gardens' for large wind orchestra, processed sounds and video. Casteels has always been interested in new media: in 2010 in his piece entitled 'Simple-X' created with violinist Seah Huan Yuh, performers played their instruments whilst triggering off additional sounds using iPads. The use of this gadget in concert was then an innovative premiere for Singapore and the region. With electro-acoustician Dirk Stromberg and art director Andrew Thomas, Casteels has created an ambitious one-hour epic with newly created e-instruments engaging in a musical dialogue with electro-acoustic sounds, dance and stunning visuals. This research entitled '2014:time:space:' culminated into a mind opening performance in the FlexiSpace of LASALLE College in 2014. New expanded versions were presented in the ArtScience Museum (2015), during the 7th Duong Dai Festival in Hanoi (2015), as finale of the closing concert of the International Meeting temp’Ora in Bordeaux, France (2016), in educational institutions such as NUS, SOTA, Eunoia and National Junior Colleges and the Lycée Français, Singapore (2017 and 2018). Casteels has composed for silent advertising movie (2011, Swiss Business Association Singapore), silent art movie (2011, National Museum Singapore) and for a film on forest fires (2014, Kyoto). Casteels is also an active arranger for choir, organ, piano, wind and guitar orchestras. Most notable are four suites of Christmas songs (1981, 1983, 2009 and 2017), Kreisleriana (2004) a concert paraphrase for soli violins and orchestra after Fritz Kreisler, Flamenco Cantata (2010 and 2016) for choir and flamenco guitarist, singers and dancers, Grosse Sonate (2010 and 2015) a seamless collage of quotes from each movement of each of Beethoven’s 32 piano sonatas, Sixty-Six (2013) for six cellos, a collage of 66 quotes extracted out of the entire cello repertoire, Rakhmania for two pianos (2015), Flower Drum and Dayun Sampan for pipe organ (2015), Walking through Pictures at an Exhibition, a metawalk for a large number of clarinets (2018). Casteels enjoys sharing his ideas about music and has been invited to present academic papers at international conferences such as the 9th International Conference of Asia Pacific Confederation for Arts Education in Singapore, the Griffith University Brisbane Conference Connecting With, at the Australian National University, the Victoria University in Wellington New Zealand and the European League of Institute of the Arts. In 2015 he shared a panel during the 2nd Singapore Heritage Science Conference and co-presented a paper during the 2nd International Symposium on Sound and Interactivity SI15. Both conferences were organized by the Nanyang Technological University. Casteels was the composer mentor of the Young Composers Forum 2016 organized by the Composers Society Singapore. In 2015 the National Archives conducted extensive interview sessions with Casteels under the Oral History Programme. Several of his compositions have currently been chosen to be used as the subject of Doctorate theses. Musicologist S.K Lee has analyzed works by Casteels in Scions of the Musical West: Singapore at Cultural Crossroads, in the Journal of the Royal Musical Association and conference presentation for the American Musicological Society, Society for Music Theory, Society for Ethnomusicology. Casteels believes in making music accessible to audiences and has given pre-concert talks and public seminars for the Singapore Symphony Orchestra (SSO), the Singapore Lyric Opera, the NUS Alumni House, the NUS Centre For The Arts, NUH for its Guest Speakers Series entitled Grand Round, the Alliance Française de Singapour (amongst others l’es Jazz AF Conférences’ and the cycle ‘Apéro Opéra’) and l'Association Française de Singapour. Additionally, Casteels has given interactive commentaries in concerts that he conducted with the Singapore Symphony Orchestra and the Malaysian Philharmonic Orchestra. A passionate educationist, Casteels is noted for his pedagogical work in piano, analysis, composition and conducting. He has established the music departments of - at the time - two new secondary schools in Singapore, the Saint Joseph’s Institution International School and Emaar International School. Casteels was tasked to establish the Juilliard – Nord Anglia University programme at Dover International School. Casteels has functioned as External examiner for the Lycée Francais de Singapour, Faculty of Music of the University Melbourne, the Nanyang Academy of Fine Arts and the Yong Siew Toh Conservatory of Music. Casteels is a committed member of the Nature Society (Singapore). Several of compositions reveal his concern for the nature degradation and biodiversity impoverishment: Sonata Profana (2002), A Day in the Life of a Garden and Spirit of Wood (2003), two series of Bird Songs (in 2009 on species threatened with extinction in Singapore and in 2015 on species that are already extinct in Singapore), Holler across the Holler (2010), Hydropyre and Travelogue (2014 and 2015), Aqua Ignis (2016) and Of Mountains, Water, Rice, Birds and People… (2018). As an artist who is socially responsible and aware of the need to give back to society, Casteels organized concerts and performed as conductor or pianist in prisons (Changi), hospitals (Mount Alvernia Hospital, National University Hospital, Singapore General Hospital’s Art For the Heart and MusicFest@SGH); for BLAS and BLBG (respectively the Belgian and Luxemburg Association of Singapore and the Belgian Luxemburg Business Group in Singapore), for the French Chamber of Commerce in Singapore and the Swiss Business Association Singapore, Global Trader Summit in 2009; for charities and fundraising galas such as: National Day Parade in 2004, Message of Peace in 2008, the National University of Singapore Homecoming Alumni Gala, New York State Bar Association Gala Dinner, Tan Ean Kiam Arts Award Gala Concert and the Alliance Française de Singapour 60th Anniversary Gala Concert, 53rd AAPA-SIA Convention Closing Ceremony Gala Dinner, all in 2009, the Bone Marrow Donor Programme White Night Gala Dinner in 2010, Gala Dinner Cancer Society of Singapore and Bell’Epoque for Japan following the 2011 Tôhoku Earthquake & Tsunami, Home Nursing Foundation in 2012, the ComChest Care & Share Charity show live tv broadcast by MediaCorp from the World Sentosa Resort Auditorium in 2014, the 1st International Conference of Humanitarian Medical Missions in 2014. He conceived, organized and performed on the Shaw Foundation Symphony Stage Botanic Gardens Percussion 101, the first SG50 concert to celebrate Singapore’s Golden Jubilee.